Universal secondary education is vital if rural China is to achieve long-term socioeconomic sustainability, as education offers the pragmatic skills and knowledge base that would allow those living in rural China to adapt to the knowledge-intensive global economy (Rong and Shi, 2001: 108-9; Bush and Haiyan, 2000: 62; Oxfam Report, 1999: 1; Liu, 2004: 5; Bennell and Furlong, 1998). In rural China, each student ostensibly has access to nine years of mandatory education (Liu, 2004: 6). However, local governments are often incapable of subsidizing compulsory schooling, particularly post-primary schooling (Liu, 2004: 12; Hannum, 2005: 278; Rong and Shi, 2001: 108). Consequentially, poor rural families prioritize sending sons for post-primary education and sacrifice the educational opportunities of their daughters (Tsui and Rich, 2002: 82; Lu, 2012: 331). Poorly educated rural Chinese adolescents, especially girls, experienced numerous sociopsychological challenges, and face an increased risk of suicide. Those from economically disadvantaged backgrounds were at greatest risk (Zhang et al., 2004; Zhang et al., 2010: 773; Hesketh, 2002). Suicide remains the leading cause of death among Chinese adolescents, particularly those from rural areas (Philips et al., 2002). China accounts for over 40% of the reported suicide cases worldwide, yet the Chinese population only comprises approximately 20% of the global total (Hesketh et al., 2002: 230). A great deal of existing literature suggests that Chinese girls living in rural areas, particularly those from poorly educated backgrounds, do not develop a strong sense of self-worth (Tsui and Rich, 2002: 80; Hesketh et al., 2002: 230). Those with poor self-worth were more likely to develop mood and mental disorders, and as a consequence, might be at greater risk of suicide (Zhang et al., 2010: 774; Hesketh et al., 2002: 234). Building on existing studies conducted in 2000s or earlier, this paper investigates the nuanced relationship between years of schooling and sociopsychological challenges among rural Chinese girls in a contemporary context, in an attempt to understand whether less educated rural Chinese girls remain uniquely sociopsychologically vulnerable. Poor, patriarchal, rural families often rely on their sons to create a satisfactory financial return and as a result, educational investment prioritises sons over daughters (Zhang et al., 2011: 146, Tsui and Rich, 2002: 82; Lu, 2012: 331). As a result, daughters often develop a sense of worthlessness and a belief in self-sacrifice (Ngai, 2005: 5; Tsui and Rich, 2002: 87; Lu, 2012: 331). Dong et al. (2009: 187) conducted detailed interviews with a sample of 186 respondents in six rural counties in Liaoning in 2006. The study concluded that boys often received more educational support than their female counterparts as male children were perceived as prospective breadwinners for the family. Jie Zhang et al. (2011: 131, 147) used longitudinal data from the 2000s from the Gansu Survey of Children and Families (GSCP) and found that 49% of rural Chinese parents expect their sons to create a satisfactory financial return for the family, but only 44% had similar expectations of their daughters, and 42% of families perceived investments and aspirations focused on the success of their daughters as a waste of resources (ibid: 146). A similar longitudinal study in Gansu was conducted by Emily Hannum et al. (2009: 478), which utilised the Gansu Survey of Children and Families (GSCF) and followed 1,997 children aged between 9 and 12 from 2000 to 2007. The study found that 57.2% of rural parents believed they should rely on sons for support during their old age, and only 22.9% of respondents disagreed with this assertion (Hannum et al., 2009: 480). Ming Tsui and Lynne Rich (2002: 80) surveyed 1,040 junior secondary school students from three schools in rural Wuhan. They found that poor rural Chinese girls with brothers developed an entrenched sense of worthlessness and a belief in self-sacrifice (Ngai, 2005: 5; Tsui and Rich, 2002: 87). Xue Lan Rong and Tianjian Shi (2001: 113, 149) analyzed the rural component of the National Sample Survey of the Situation of Chinese Children and found that families in the least developed and affluent areas, including rural counties in Zhejiang Province, often relied on daughters to perform domestic duties while educational resources were invested in their brothers (ibid: 114). However, the study failed to explore whether less financially secure rural families without sons would invest in their daughters’ education. Fewer years of formal education have a negative effect on career prospects, meaning that rural females encountered a more significant discrepancy between their socioeconomic aspirations and reality. Consequentially, poorly educated girls often experience numerous strains which jeopardized their sociopsychological wellbeing (Zhang et al., 2011: 2006). The aforementioned study by Xue Lan Rong and Tianjian Shi (2001: 113, 149) also found that education helped women develop stronger aspirations and greater employment prospects (Gupta, 2000: 218). However, Zhang et al. (2010: 774; 2011: 2006) utilised the Chinese version of the Structured Clinical Interview for DSM-IV (SCID) to examine sociopsychological difficulties among adolescents in sixteen rural counties in China by random sampling method. They found that the average number of years of formal education among female samples was 7.4 (standard deviation = 2.8), compared with 9.2 for the female control groups (standard deviation = 2.4), and those with fewer years of formal education demonstrated negative association with their career prospects and aspirations. The study also found that those from poorly educated female sample groups experienced an increased risk of suicide, in addition to suffering from mood and mental disorders, in these rural counties. Each of these results exhibits a significant level of p< 0.05 (Zhang et al., 2010: 776-7). Hesketh et al. (2002) engaged in similar work and carried out cross-sectional survey by using self-reported questionnaires in six secondary schools in rural Zhejiang Province, where respondents were predominantly aged between 13 and 17 (Hesketh et al., 2002: 230). Worryingly, rural Chinese girls were twice as likely to commit suicide than their male counterparts, and over half of those who had already faced psychological challenges argued that they had a poor sense of worth at home and at school (ibid: 234). This paper examines the nationwide Chinese Longitudinal Healthy Longevity Survey (CLHLS) 2014 Series via ordered logistic regression analysis, in order to understand the association between educational opportunities and sociopsychological wellbeing among rural Chinese girls in less affluent areas of the country. In China, there is a total of 56 ethnic groups. Nearly 92% of the Chinese population are Han Chinese, often referred to as ethnic Chinese (Hannum, 2002: 95). The Han Chinese population enjoys far more educational opportunities than the rest of 55 ethnic minority groups (ibid). Consequently, a direct comparison of educational achievements between Han Chinese samples and ethnic minority samples is not worthwhile. This paper therefore focuses exclusively on Han Chinese samples (N= 5,120). From Table 1, gender is divided into male (N= 2,445) and female (N= 2,675) (see Appendix A). Male is coded as 0 (i.e. dummy variable) and female is coded as 1. Male samples here serve as a control group. As mentioned above, existing studies argue that poor families prioritise sending sons for post-primary education over daughters (Tsui and Rich, 2002: 82; Lu, 2012: 331). However, while this national survey exclusively collected samples from impoverished rural regions in China, samples from these regions might not necessarily come from poor families. As a result, this paper takes economic status into account as an independent variable. Economic status is divided into financially secure (N= 4,459) or financially insecure (N=521) on a self-reported basis (see Appendix A). Those who were financially secure are coded as 0 (i.e. dummy variable) while those who were financially insecure are coded as 1. Furthermore, as mentioned above, poorly educated rural Chinese adolescents, especially girls, are at greater risk from sociopsychological challenges (Zhang et al., 2004; Zhang et al., 2010: 773; Hesketh, 2002). Moreover, Zhang et al. (2010: 774; 2011: 2006) found that educational disparities by gender only occur during post-primary education, especially in secondary education. Consequentially, this paper takes educational status into consideration. Educational status is divided as having primary educational qualification (N= 4,402) and having post-primary education qualification (N= 675). Those who had no post-primary educational backgrounds are coded as 0 (i.e. dummy variable) while those with post-primary educational backgrounds are coded as 1 (see Appendix A). In this survey, sociopsychological wellbeing of samples could be accessed by asking respondents living in rural China whether they self-reportedly felt fearful and anxious (N=4,996), lonely and isolated on a regular basis (N=4,993), and useless on a regular basis (N= 4,995) (See Appendix B). The answers are all measured on an ordinal scale from 1 (always) to 5 (never). From Table 2, it is statistically significant at p< 0.001 to argue that female samples were more likely than male samples to feel fearful and anxious (Odds ratio = 0.74, Std. err. = 0.04), lonely and isolated (Odds ratio = 0.76, Std. err. = 0.04) and useless (Odds ratio = 0.73, Std. err. = 0.04), while keeping other independent variables constant. These suggest that the odds of female samples is 0.74 times, 0.76 times and 0.73 times than that of male counterparts in terms of feeling of fear and anxiety, loneliness and isolation, and uselessness respectively. Furthermore, it is statistically significant at p< 0.001 to argue that financially insecure samples were by far more likely than financially secure samples to feel fearful and anxious (Odds ratio = 0.48, Std. err. = 0.04), lonely and isolated (Odds ratio = 0.41, Std. err. = 0.04) and useless (Odds ratio = 0.38, Std. err. = 0.03), while keeping other independent variables constant. Specifically speaking, the odds of financially insecure samples is 0.48 times, 0.41 times and 0.38 times than that of financially secure samples in terms of feeling of fear and anxiety, loneliness and isolation, and uselessness respectively. Those who had post-primary education were less likely than those without post-primary education to feel fearful and anxious (Odds ratio = 1.33, Std. err. = 0.11), lonely and isolated (Odds ratio = 1.50, Std. err. = 0.12) and useless (Odds ratio = 1.64, Std. err. = 0.13), while keeping other independent variables constant. Here the odds of samples with post-primary education is 1.33 times, 1.50 times and 1.64 times than that of samples without post-primary education in terms of feeling of fear and anxiety, loneliness and isoaltion, and uselessness respectively. A Brant test, followed by running the ordered logistic regression model, tested for the parallel regression assumption. This assumption states that the relationship between each pair of outcomes is identical. This means ordered logistic regression assumes the cofficients that address the relationship between the lowest and all higher categories of the dependent variable are identical to those that address the relationship between the next lowest category and all higher categories (UCLA, 2018). Since parallel regression assumption is violated, a less parsimonious general ordered logistic regression model might be favoured, which allows for variable effects across sociopsychological wellbeing categories (see Appendix C, Appendix D, Appendix E). However, since the results from the ordered logistic regression models and the general ordered logistic regression models are similar, it should be reasonable to continue using the ordered logistic regression model, as shown in Table 2 (see Appendix F). Problems might arise from using odds ratios as a constant factor change in the odds which is not in alignment with a constant change or factor change in the probability. Predicted probabilities are therefore analysed. From Table 3, predicted probabilities (in %) of the feeling of fear and anxiety are calculated. Compared with samples from financially secure backgrounds, those financially insecure samples were far less likely to avoid feeling fearful and anxious. Specifically, financially insecure males with primary educational backgrounds had 0.240 probability to be completely without fear and anxiety, compared with 0.399 probability of financially secure male with primary educational backgrounds. Financially insecure females with primary educational backgrounds had 0.190 probability to be completely without fear and anxiety, compared with 0.330 probability of financially insecure females with primary educational backgrounds. Financially insecure males with post-primary educational backgrounds had 0.297 probability to be completely without fear and anxiety, compared with 0.470 probability of financially insecure males with post-primary educational backgrounds. Financially insecure females with post-primary educational backgrounds had 0.238 probability to be completely without fear and anxiety, compared with 0.396 probability of financially insecure females with post-primary educational backgrounds. Table 3 demonstrate that financial backgrounds have an impact on samples’ feeling of fear and anxiety. In addition to economic factors, those who had post-primary educational backgrounds were less likely than those who were only primarily educated to “always” and “often” feel fearful and anxious, in both genders. For those who were financially insecure, primarily educated male samples had 0.007 and 0.051 probabilities to “always” and “often” feel fearful and anxious, compared with 0.005 and 0.039 probabilities of post-primary educated male samples respectively. Among those who were financially insecure, primarily educated female samples had a 0.009 and 0.068 probabilities to “always” and “often” feel fearful and anxious, compared with 0.007 and 0.052 probabilities of post-primary educated female samples respectively. Therefore, Table 3 also indicate that samples having post-primary educational backgrounds suffered less from fear and anxiety, while keeping financial backgrounds and gender constant. These also demonstrate that male samples suffered less from fear and anxiety, when keeping financial backgrounds and educational backgrounds constant. These predicted probabilities are in line with Table 2 which both suggest educational background, gender and especially financial background each has an impact on feeling of fear and anxiety. From Table 4, predicted probabilities (in %) of the feeling of loneliness and isolation are calculated. Compared with samples from financially secure backgrounds, those financially insecure samples were far less likely to be absent from feeling lonely and isolated. Specifically, financially insecure males with primary educational backgrounds had 0.209 probability to be from from loneliness and isolation, compared with 0.391 probability of financially secure males with primary educational backgrounds. Financially insecure females with primary educational backgrounds had 0.167 probability to be free from loneliness and isolation, compared with 0.328 probability of financially secure females with primary educational backgrounds. Moreover, financially insecure males with post-primary educational backgrounds had 0.283 probability to be free from loneliness and isolation, compared with 0.491 probability of financially secure male with post-primary educational backgrounds. In addition, financially insecure females with post-primary educational backgrounds had 0.231 probability to be free from loneliness and isolation, compared with 0.422 probability of financially secure females with post-primary educational backgrounds. These figures demonstrate that financial background itself has an impact on samples’ feeling of loneliness and isolation. Aside from financial factors, those who had post-primary educational backgrounds were less likely than those who were only primarily educated to “always” and “often” feel lonely and isolated, in both genders. For those who were financially insecure, primarily educated males samples had 0.020 and 0.090 probabilities to “always” and “often” feel lonely and isolated, compared with 0.014 and 0.063 probabilities of post-primary educated male samples respectively. Also, for those who were financially insecure, primarily educated female samples had a 0.027 and 0.114 probabilities to “always” and “often” feel lonely and isolated, compared with 0.018 and 0.080 probabilities of post-primary educated female samples respectively. However, these figures indicate that samples having post-primary educational backgrounds suffered less from loneliness and isolation, while keeping financial background and gender constant. The data also demonstrates that male samples suffered less from loneliness and isolation, when keeping financial backgrounds and educational backgrounds constant. These predicted probabilities are in line with Table 2 which both suggest educational background, gender and especially financial background each has an impact on feeling of loneliness and isolation. From Table 5, predicted probabilities (in %) of the feeling of uselessness are calculated. Compared with samples from financially secure backgrounds, those financially insecure samples were far less likely to be free from feeling useless. In specific, financially insecure males with primary educational backgrounds had 0.072 probability to be free from uselessness, compared with 0.171 probability of financially secure males with primary educational backgrounds. Also, financially insecure females with primary educational backgrounds had 0.054 probability to be free from uselessness, compared with 0.130 probability of financially secure females with primary educational backgrounds. Moreover, financially insecure males with post-primary educational backgrounds had 0.113 probability to be absent from uselessness, compared with 0.252 probability of financially secure male with post-primary educational backgrounds. In addition, financially insecure females with post-primary educational backgrounds had 0.085 probability to be free from uselessness, compared with 0.196 probability of financially secure females with post-primary educational backgrounds. These figures demonstrate that financial background itself has an impact on samples’ feeling of uselessness. Aside from financial factors, those who had post-primary educational backgrounds were less likely than those who were only primarily educated to “always” and “often” feel useless, in both genders. For those who were financially insecure, primarily educated male samples had 0.155 and 0.251 probabilities to “always” and “often” feel useless, compared with 0.101 and 0.194 probabilities of post-primary educated male samples respectively. Also, for those who were financially insecure, primarily educated female samples had a 0.202 and 0.283 probabilities to “always” and “often” feel useless, compared with 0.134 and 0.232 probabilities of post-primary educated female samples respectively. This data indicates that samples having post-primary educational backgrounds suffered less from uselessness, while keeping financial backgrounds and gender constant. It also demonstrates that male samples suffered less from uselessness, when keeping financial backgrounds and educational backgrounds constant. These predicted probabilities are in line with Table 2 which both suggest educational background, gender and especially financial background each has an impact on feeling of uselessness. 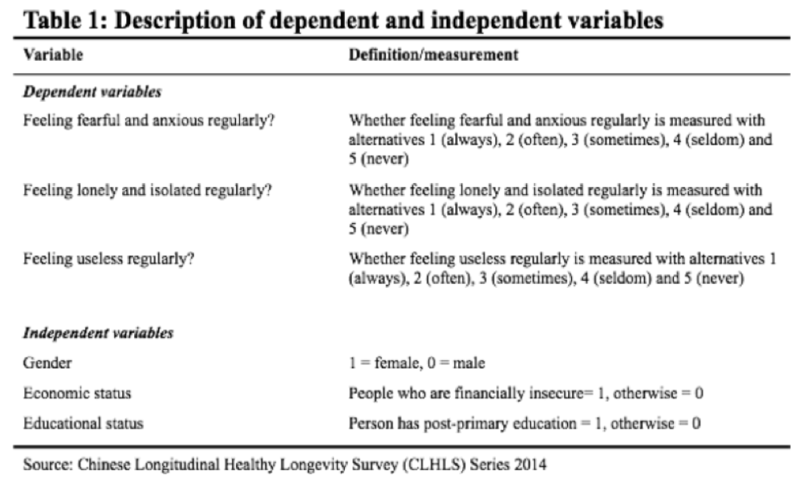 In line with existing literature, the Chinese Longitudinal Healthy Longevity Survey (CLHLS) 2014 Series indicates that gender, economic status and educational status are all contributing factors to sociopsychological wellbeing among Han Chinese living in impoverished areas of rural China. In comparison to financially secure individuals, financial insecurity has a very solid negative association with sociopsychological wellbeing. Since existing literature focuses exclusively on the sociopsychological wellbeing of financially insecure individuals or family units, a comparison between financially secure and financially insecure individuals’ sociopsychological wellbeing would offer a more nuanced insight into the socioeconomic impact on sociopsychological wellbeing when financially better-off individuals serve as a controlled group. This paper also reinforces the understanding that better educated individuals experience better sociopsychological wellbeing. Interestingly, when economic status and educational status remain constant, female samples continue to encounter more sociopsychological challenges than their male counterparts. It is possible that some contributing factors to sociopsychological wellbeing are not controlled in the ordered logistic regression model, and therefore female samples remain more sociopsychologically vulnerable than their male samples. Understandably, economic and educational status alone is not entirely representative of socioeconomic status among rural Chinese individuals. This paper does not take into account entrenched Confucian values in rural China, where sons are responsibilities for external duties and daughters remain within the domestic sphere. As a result, even though this paper attempts to control economic and educational status between young men and women in rural China, the latter might still fail to address how the context created by Confucian values adversely affect young women’s sense of self and sociopsychological wellbeing more generally. A more detailed literature review and a new framework of research design should be carried out in order to identify other possible, historical and social contexts that might impact upon the sociopgsychological wellbeing of rural Chinese women. Unlike most existing research, which examine young women’s sociopsychological wellbeing exclusively in impoverished rural families in China, this paper acknowledges the possibility that a proportion of families in rural China are more affluent. As a result, this paper compares samples from both financially secure and financially insecure families in rural China. It is noteworthy that the findings suggest financially insecure samples, especially females, are likely to feel fearful, anxious, lonely and isolated on occasion, although they are unlikely to suffer from these sociopsychological challenges to a significant extent. Financially insecure samples, especially females, are also very unlikely to be free from feelings of uselessness. These two arguments support the existing literature, which suggests that those from destitute families, especially daughters, are more likely to suffer from sense of worthlessness. Such sense of worthlessness could possibly be an attributor to negative sociopscyhological feelings, including fear, anxiety, loneliness and isolation. Undoubtedly, greater educational investments in young women would lessen the sense of worthlessness, in addition to other adverse sociopsychological feelings. However, this research suggests that the alleviation of poverty, rather than improvement of educational opportunities, has a far greater positive association with sociopsychological wellbeing among young men, and more significantly, young women in rural China. Jason Hung is currently pursuing a Masters degree in Sociology at London School of Economics in LONDON, United Kingdom.